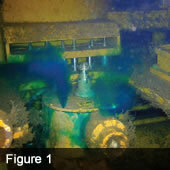 of detectionof leaks in subsea pipelines, risers and control systems. Neptune Oceanographics Ltd is a global leader in the provision of subsea pipeline leak detection services for the offshore oil and gas industry. The company places strong emphasis on R&D and constantly strives to develop better systems that are more efficient in terms of cost and detection success and simultaneously reducing adverse effects on the environment. There are several methods for subsea leak detection available from Neptune but the most commonly used are long range fluorescence and passive acoustics. In some instances temperature differential and direct real-time hydrocarbon measurements are used. Traditionally, subsea pipeline leaks have been found by visually looking for fluorescence of dyes using 'black light' (unfiltered ultraviolet [UV] light) but the major problem with this method is that the dye concentration had to be high and visibility very good. During 1999, Neptune introduced 'tuned' submersible fluorometers. These sensors significantly increased detection efficiency by eliminating the majority of the problems associated with black lights. Detection was no longer relying on visual observation. Early in 2007 Neptune Oceanographics successfully introduced their range of 'Long Ranger' fluorometric sensors that 'see' fluorescent dyes and crude oil remotely at distances of 5m or more with none of the drawbacks associated with 'black lights' or need for sensor contact with the leaking fluid. Neptune Oceanographics was founded 1999 to provide specialised techniques and provision of services that enable easy, efficient and reliable detection of leaks from submarine pipeline installations. Over 30 years experience in marine and inland water investigations throughout the world.Development of various techniques for detection of leaks from submarine pipelines and subsea installations using state of the art technology. Project management of many large scale oceanographic and environmental investigations world-wide. Experience in irrigation, local water supply and soil erosion investigations in developing countries for various agencies such as The World Bank, UNESCO and ODA. Extensive experience in the development of measuring techniques and instrumentation for the marine environment. Wide ranging experience in dredging research activities. "The system was able to detect small leaks from our SCM's, and easily detected a step change when the selector valves within the SCM were operated. Basically it backed up our suspicions, and certainly proved a reliable method of leak detection. Considering the short time frame with respect to mobilisation, the ROV interface and familiarisation was faultless as I understand."